One of the luxuries of touring and caravanning that sets it aside from tent camping is, of course, the ability to have your own on-board shower. That's a shower that only you use, the temperature of which you control, a shower which you clean to your standards and one which is pre-set to the correct height for you. OK, when the kids have all just bundled back from the beach with slightly blue lips and salty skin, there might well be a slight queue, but at least you can sit on a sofa, reading a book or make a cuppa whilst waiting in the queue for this particular shower. So we say yes! to fitting a caravan shower in your 'van if you haven't already done so. We also say yes to ensuring that caravan showers stay in tip top condition so that you guarantee that the lovely hot water heading out of your caravan shower head isn't heading down into the fabric of your 'van...which is why we also stock such a full range of caravan spares for bathrooms and shower rooms on Leisureshopdirect.com. Whether you need a portable or travel shower, ultraflow or caravan/motorhome shower you will find it here. You will also find that we stock a full range of caravan and motorhome plumbing supplies so that you can fit new or repair existing motorhome and caravan showers. Need to replace a Caravan Shower Tray? With the best will in the world, the interiors of our beloved homes-from-home can take a battering at times and your caravan shower tray will be no exception. 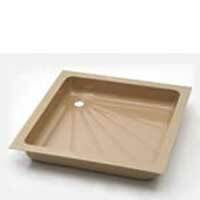 We stock a selection of shower trays in white, ivory, cream and peach in square or with an angled corner. From Thermostatic shower mixers, to swivel shower-head wall brackets we have all the components required for yout to design and enjoy a top-notch caravan shower experience! And there is no need at all to go replacing an entire unit - often it is just the shower head that needs replacing, perhaps with one with adjustable spray or a wider head for better coverage! 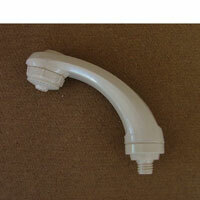 You'll find we stock a selection of high-quality Caravan Shower Heads at very reasonable prices. Whale Water Systems provide total solutions for water system management for recreational vehicles. By applying innovative design and the latest in manufacturing technology Whale offer tailor-made products for the Caravan and Motorhome world. Whale ranges of Caravan faucets and showers are specifically designed for confined spaces in the kitchen or washroom. The Whale Elite Range for use with all types of Whale pumps and other water systems. The Whale Elegance Range of showers for use on pressure or microswitch systems in caravans and motor homes.